In short, if there is an election called now, it appears Syriza-led Left will win with a stronger mandate (187 total seats against January outrun of 162 seats). 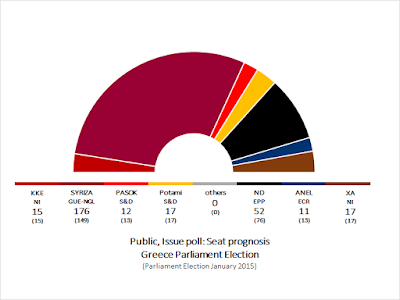 You can see more detailed polls results here: http://www.publicissue.gr/en/2768/pol-bar-145-june-2015/. Greek referendum polls are covered here: http://www.wsj.com/articles/greece-divided-on-bailout-referendum-1435397627. The Government has no option but either accept the 'bailout' terms (and thus violate its own electoral mandate) or reject it (and thus impose an outcome - default and Grexit - that is not supported by the majority of the electorate). Thus, like Syriza or not (I am with the latter camp), but it has no ethical choice to make other than conduct a referendum. Anyone claiming that in a representative democracy an elected Government has a mandate to violate in full its electoral mandate (thus accepting the 'bailout' offer as it stands) is simply anti-democratic. In a representative democracy, an elected Government has only one feasible mandate - to execute its electoral mandate. Note: I am still barred from using my Twitter account.